This is a review for the supplement Nature’s Value Brain Energizer. The manufacturer claims that this supplement supports brain function. Read on to learn more about this product and whether or not it is the ideal choice for you. Phosphatidycholine- Aids in the formation of acetylcholine, a neurotransmitter that increases the brain’s ability to release electrochemical messages. Phosptidylserine- Works to boost your brain’s function. Docosachexaenoic- Works to improve cognitive function. Eicopentaenoic- Works to improve cognitive function. Please note: This product is non-vegan and non-vegetarian because the softgels are made of gelatin. Those with a restricted diet may find this to be an issue. It is recommended that one soft gel be taken twice daily with a meal. There were no possible side effects listed on the manufacturer’s website. It was recommended that those considering taking Brain Energizer first consult with their doctor if they are taking any prescription drugs or are pregnant and lactating. The cost of this product is $39.99 for one bottle. Each bottle contains 60 softgels, which is a 30-day supply. This is a rather affordable prices, especially if this supplement does what it claims to do. The manufacturer does not appear to offer a guarantee with the purchase of this product. Many may find this lack of guarantee an issue because they may not be able to return the unused product for a full refund if they are not satisfied. The manufacturer’s website also does not appear to have any customer reviews or testimonials available, so it is unclear as to whether or not this product works. This lack of testimonials does not mean that the product hasn’t worked for people who have tried it. Individual results may vary, so what has worked for someone else may not work for you. 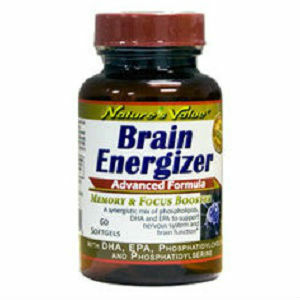 Nature’s Value Brain Energizer is supposed to promote brain function. With there being a lack of customer reviews and testimonials, it is not known if this product has worked for those who have purchased it. However, this does not mean that it has failed to work or that it will work for you. This supplement is affordable for most, but it may be an issue that there is no guarantee for it. The lack of a guarantee creates a risk when purchasing this product because if you are not satisfied with it for any reason you may not be able to receive a refund for your purchase. Ultimately, you are risking losing your money if you don’t like the product. Overall, this product could work for you, but like most supplements, individual results may vary. Depending on what you are looking for this could be the ideal choice for you. Henry Costa	reviewed Nature's Value Brain Energizer	on June 14th	 and gave it a rating of 2.